Commonly called ‘Widow’ or Snake’s Head’ iris this monotypic species is a member of the Iridaceae family and originates from around the Mediterranean Sea. The name being derived from ‘Hermes’ for Mercury, and ‘Dactylus’ meaning finger alluding to the shape of the tubers. 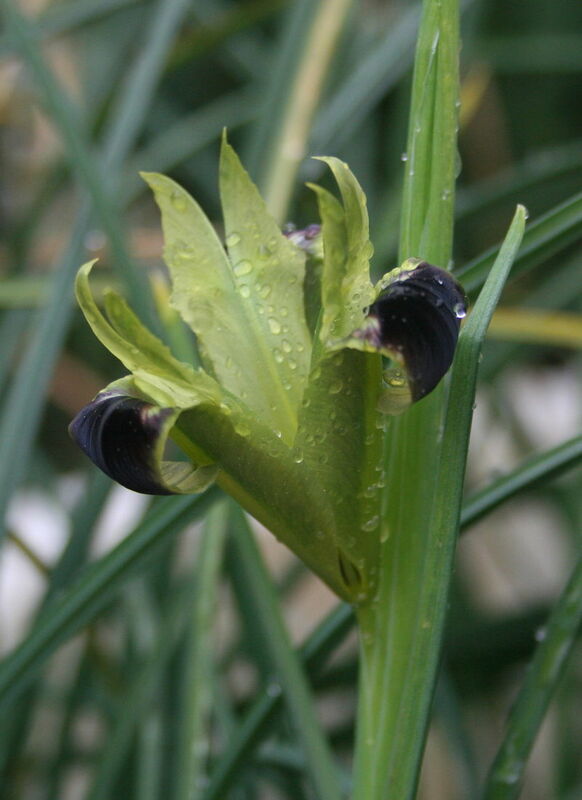 They blooms late Winter to early Spring on 30cm stems and are of an unusual lime colour, olive tepals and striking purple black falls, given rise to the common name ‘Widow Iris’. Their long reedy glaucous foliage continues to grow after flowering and can reach 50cm or more on maturity. Incorporate some complete fertiliser and lime into a sunny well drained spot. Water once a week if Winter/Spring rains are lower than the norm. They prefer a dry Summer rest. A most fascinating and alluring plant.